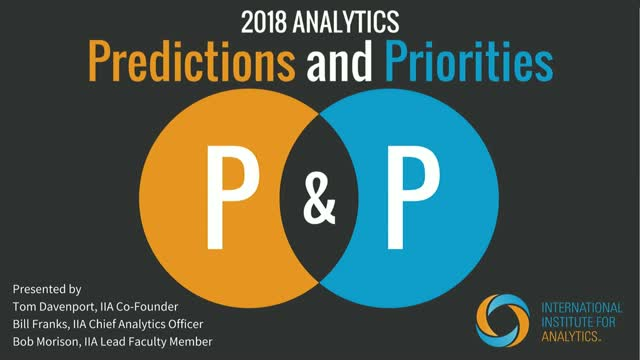 The International Institute for Analytics will unveil its annual list of top predictions and priorities on December 7. Each year, IIA shares its perspective on the year ahead in the world of analytics, presenting viewpoints from leading analytics practitioners, executives and thought leaders. This year IIA has gathered feedback from more than 200 analytics executives and our broad network of unbiased analytics experts. Join IIA Co-Founder Tom Davenport, IIA CAO Bill Franks, and IIA Lead Faculty Bob Morison as they discuss the major trends and pressing priorities analytics professionals should pay attention to in 2018. Don't miss this compelling hour of insights to learn where to focus your time, attention and resources in the coming year.